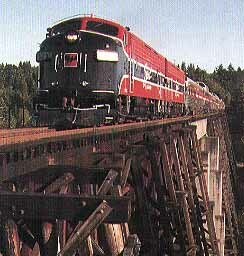 Ride and dine in our luxurious vintage rail cars as you journey along the shores of Lake Washington and over the historic Wilburton Trestle, the longest wooden trestle in the Northwest. The train features many events, including murder mystery trains, a 4th of July fireworks train, and New Year's Eve Celebration train. November through April children ride free when accompanied by a paying adult. Water Music Festival Seaview WA April1 The Water Music Festival is an all-volunteer non-profit organization dedicated to bringing quality chamber music to the Lower Columbia River Region. Astoria-Warrenton Crab and Seafood Festival Warrenton OR April26 Crab and seafood as well as entertainment. Listen to the Astoria HS Jazz Band on Sunday. Seattle Japanese Cultural Festival Seattle WA April26-28 The festival features Japanese exhibits, performances, and demonstrations. Held at the Seattle Center in the Fisher Pavilion. The annual festival began in 1976 with a gift of 1,000 cherry trees to the city of Seattle from the Japanese government to celebrate the U.S. Bicentennial. Grays Harbor Shorebird Festival Hoquiam WA April26-28 Witness the migrating shorebirds at Grays Harbor National Wildlife Refuge and other birding hotspots in Grays Harbor County.